A bold reinterpretation of some of the most decisive battles of World War II, showing that the outcomes had less to do with popular new technology than old–fashioned, on–the–ground warfare. The military myths of World War II were based on the assumption that the new technology of the airplane and the tank would cause rapid and massive breakthroughs on the battlefield, or demoralization of the enemy by intensive bombing resulting in destruction, or surrender in a matter of weeks. The two apostles for these new theories were the Englishman J.C.F. Fuller for armoured warfare, and the Italian Emilio Drouhet for airpower. Hitler, Rommel, von Manstein, Montgomery and Patton were all seduced by the breakthrough myth or blitzkrieg as the decisive way to victory. Mosier shows how the Polish campaign in fall 1939 and the fall of France in spring 1940 were not the blitzkrieg victories as proclaimed. He also reinterprets Rommel's North African campaigns, D–Day and the Normandy campaign, Patton's attempted breakthrough into the Saar and Germany, Montgomery's flawed breakthrough at Arnhem, and Hitler's last desperate breakthrough effort to Antwerp in the Battle of the Bulge in December 1944. 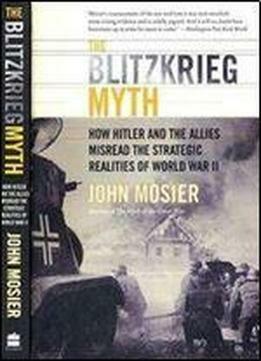 All of these actions saw the clash of the breakthrough theories with the realities of conventional military tactics, and Mosier's novel analysis of these campaigns, the failure of airpower, and the military leaders on both sides, is a challenging reassessment of the military history of World War II. The book includes maps and photos.